1. Recognise that bullies rely on subservient behaviour from their victims. 2. Decide to stand up to the bully by naming their behaviour explicitly. 3. Tell them that, if they want to talk to you, then they must talk to you properly. 4. Tell them that if they continue to talk to you badly, you will report the matter. 5. Do NOT tell a bully how they make you feel ie intimidated, upset or frightened. 6. Look at the bully directly in the eye and hold their gaze resolutely when talking to them. 7. Keep your voice volume slightly louder than your normal, but don't shout. 1. Recognise that a bully relies on subservient behaviour from their victims. Bullies rely on the fact their victims play a subservient role. As soon as you choose to deny them a subservient response, the bully is vulnerable to defeat. The first step to defeating the bully is to REFUSE to give a subservient, or compliant response. The next step to defeat the bully is to overtly NAME the behaviour. If they are swearing at you, say, "You are swearing at me". If they are pointing at you, say "You are pointing and swearing at me". Make the behaviour explicit by naming it exactly. Give the bully the choice, if they want to talk to you then they MUST talk to you properly. If they wont talk to you properly then the conversation is over. 4. Tell them that if they continue to talk to you badly, you will take the matter to the authorities. Tell the bully that if they continue to talk to you improperly then you will report their behaviour to the relevant authority (a manager, police, trade union etc). Imply that they will gain a painful consequence for any continued bullying. Do not tell the bully that they make you feel upset or intimidated. That is POSITIVE feedback for the bully, which will embolden them and encourage them to continue the bullying. You must not show the bully that their tactic is working. 6. As you talk, look at them directly into their right-eye and hold their gaze resolutely. As you talk, make direct eye contact with the bully. Keep looking directly into their right-eye and hold your gaze steadily, as you speak. This is important. Many bullied people signal submissiveness by a lowered gaze and a refusal to make eye contact. If you want to be more assertive, then learn to hold eye contact for extended periods of time. This will make you feel stronger. The bully will be forced to reassess you as having a stronger personality than they originally thought. 7. Keep your voice volume slightly louder than your normal level, but don't shout. Raise your voice volume from "Normal", to "Slightly louder than Normal". This is another way to demonstrate assertiveness and to deny the bully a submissive response. Don't shout. Just pump up the volume a little bit. Combined with direct eye contact and explicit language, you will seem to be a more formidable personality and the bully will have met his Waterloo with you! People disagree. 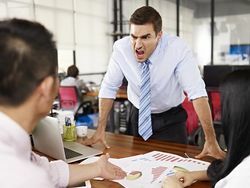 But, whatever the cause of a disagreement, a manager must learn how to handle it professionally, before it escalates into conflict and interferes with the business. Here are five common strategies for resolving disputes. It is vital that all staff are taught how to handle complaints in a professional manner. Follow this six step method for handling complaints successfully and improve your overall customer service. Conflict is inevitable since we all have our own ideas about what is true, fair and good. How we handle conflict is important.